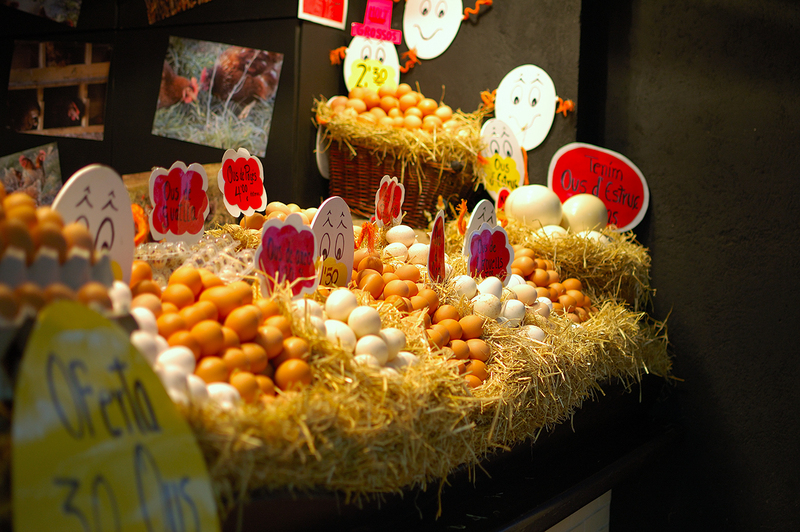 An egg stand at Mercat de L'Abaceria aka Travessera de Gràcia market in Barcelona. There was a very similar post about another egg stall in La Boqueria. I think both are quite attractive and you really feel like buying dozens of eggs thanks to their imagination and good taste. That looks sooooo nice and creative! :) I like it. Carlos, I love this image SO much. It delights me! May I post it on my Clutterquake blog sidebar with a link to your blog? Pleasepleaseplease! -Thanks Gunn, glad u like it. That's a cute egg stand! Which came first, the chicken or the egg?! That is super for you to allow me to post the shot. I will feature it in a new post with a link back to you and from then on it will be in the sidebar. I love it so much!